Interesting post, Karen. The bird in flight thing…we all long for that, don’t we? We have your Canadian geese passing overhead frequently here along the lake by Chicago, and hearing their call, watching them in formation always hits some primal thing in me. So kitchy or not, it strikes something real. Yes, birds in flight, what is more beautiful than that? It’s not the birds in flight that I find kitschy at all but just the way the image came across to me. I guess it’s partly the struggle to capture a true sense of something without it becoming derivative and over used. An artistic conundrum, I guess. Thank you for your comment, Lois. But maybe also in a better way? [Also, can something cease to be profound because it’s cliche?…or is that the very definition of cliche?] Agh, as you can see, your posts twisted my brain up….. some great thoughts!! PS: Kitsch topic or not, that is a beautiful photo. I know what you mean about trying to be original. I sort of depend on the landscape to “show me things” and when it seems to have nothing to show me I try to make something fresh. It struck me that this was the opposite of that in some way. But I like that it got me thinking about how we make/perceive art and that every so often an image will reveal something you weren’t expecting. I’ll have to think about your cliche idea! Thank you. Interesting comments. I admit that I thought ‘yet another’ and then I saw your title. Very cool to see your thoughts on it. Hmmm, stories being told over and over again but slightly different each time… I hadn’t thought of it that way. Karen, Well,let’s begin with the fact that this is a very well thought out photograph, visually arresting and very much your own style. Now as far as subject matter, does an original work of art lose its originality if the subject matter is unoriginal? How can that be? I think of Monets study of haystacks – how many did he paint? Each one a masterpiece of color, shading and shadow. Sound familiar? All an artist can really do is show us another way of looking at the world – find the extraordinary in the mundane. I agree that fully exploring a subject can result in all kinds of originality, and learning. Maybe this particular realization is just part of that process? Sometimes things will feel fresh and sometimes they won’t. There are lots of visual ghosts out there! Thanks for your comment, Wolfgang. Very entertaining! fascinating words Karen. to me the image is one without a past. and part of me can not but wish that the duck wasn’t there. Maybe I will post the two images separately in the next post. I think perhaps I was trying to make something different and in the end it felt “the same”. Thanks so much Chris for your comment. It’s really quite fascinating to read the reactions! Your own view on the picture is quite inspiring! Karen, at the end of the day, it is very much in tune with your aesthetic. I don’t mean to be controversial, but the image is rock solid. The image is ‘new’, because it is your image. Period. Thank you, I think, yes, it is in tune with my aesthetic but I suppose there is a myriad of cultural imagery in my mind that makes me feel like I’ve seen this again and again. Maybe it’s not a bad thing, though but for some reason it left me unsettled and that’s why I posted it. I love that there is discussion and different perspectives. Since you used two different shots, if you wanted to avoid the cliche (or create another!) you could use the duck layer twice, flying in opposite directions!!! Interesting that you make that comment because knowing when to leave something alone or push it further (in making art /photographs) can be tricky. It is something about the birds that makes it a bit “the same”, but still, I would definitely say different. Your elegant way. Yes, the bird – maybe it’s the particular form, and the size of the bird on the landscape. Thanks for your comment, Bente – it’s much appreciated. I don’t find it kitsch. Three ceramic ducks diminishing in size and stuck on the wall – that’s kitsch. This is rather lovely. I have mixed feelings over this piece; I like it and I don’t like it at the same time and I guess that’s why I posted it. Its a beautiful image. To me, kitsch is about pandering to sentimentality. If you constructed this image to do that, you have failed. There is something more artful here. 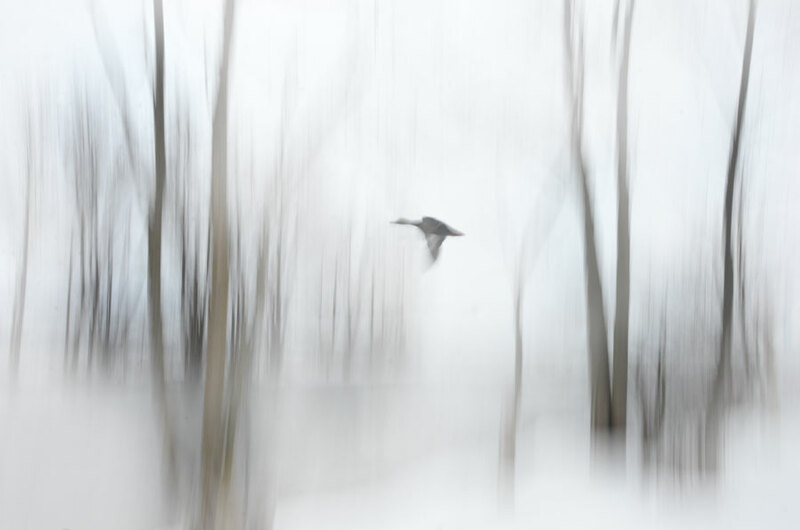 The image of mine posted over on Helen’s site–of a bird in fog–was taken with my iPhone on the fly. It does, as you say of many such images, display a painterly motif that nowadays is seen as cliched. But that is not always the same as kitsch. I didn’t construct this image for sentimentality and yet that’s how it makes me feel for some reason. It surprised me, actually, how many associated images started flashing through my mind. Perhaps it was those associations that leave me somewhat unsettled about the subject matter. Thanks for your comments, it’s nice to hear your perspective. Exactly. Your two words speak volumes. All I can say is, I’ve seen many pictures of trees and birds in flight; looking at your image first, then reading your words, I see nothing “kitschy”. It’s a reinterpretation of a particular theme, and I rather enjoyed it. Thank you, Steve. I’m glad you enjoyed it! It isn’t what I would call kitsch, but it does make me feel slightly uneasy, like you. I think it’s to do with the composition and having the bird in the centre, and the trees framing the edges. When I make woodland mosaics I normally have a bird (normally flying somewhere on the right side of the picture – sort of rule of thirds I suppose), but your composition is breaking rules and that’s not such a bad thing! For me a single bird symbolizes freedom and loneliness. Kate, it’s interesting what you say about the bird – it really does not work there but it didn’t work anywhere else either. So yes, the whole thing feels uneasy and perhaps I associate it with kitschy visual references so I present it as a sort of unsuccessful working/thought process. I appreciate your insight, thank you! I think this is fabulous Karen. I don’t find it Kitch at all. As somebody said, perhaps if there were three ducks, diminishing in size and in formation replicating the ceramic ones people used to put on their walls, well yes, that would be kitch. I love to see birds in flight, I’ve had a passion for flying for as long as I can remember. It touches me very deeply. Birds in flight are incredibly beautiful but somehow this image is unsettling to me. It is interesting an interesting discussion, isn’t it? I relate to your thoughts about about struggling with certain subjects. Thanks for your comment, Christian. You have developed a typical style and this style is yours. Therefore this work deserves all of our attention from those who are able to respect your style. I admit and understand Kate’s note. The duck in center position , immediately attracted our attention and we might be falling in the pitfall to forget the beautiful surroundings of it. To be rhetoric : what if the duck was placed between the trees and above the Avalon? Would that not be that emotion you ‘d like to express ? In any case and if I may link the bird in the center to be ‘ your kitsch ‘ you found away to express our appreciations to deny , it is Kitsch:) ; Indeed I find your style and this photograph not Kitsch-y and very intense . True , I forgot already the bird in the center 🙂 . I suppose it does express a certain emotion but the reason why I chose this title is because of how I reacted to it personally and the images/ideas that flowed through my thoughts. It really is interesting to hear other people’s thoughts about the image and I appreciate your feedback. I hadn’t thought about it the way you suggest – those are interesting thoughts. I am happy it holds you. When you said in a comment above, “I think my reaction might come from seeing a lot of “birds in flight over the Canadian landscape” sort of art…” I thought that could be a clue. Does your reaction have to do with your relationship to your landscape, your having looked at it, and at depictions of it so thoroughly, and your need to find new ways to express the way you feel about that particular landscape? That can be a struggle. Then, for a lot of non-Canadians or non-northerners, it might look new. For me, it’s a beautiful image. (If the trees were totally even and straight, and no bird, it would look like the tutorials I keep seeing in photo mags of how everyone can make a cool blurry forest picture). I used to refuse to do anything representative at all – I did conceptual art, in the 70’s in art school. But over time, I got back to being able to enjoy representative work. And I think that’s another clue: enjoyment. Thanks for your feedback! I suppose I am always looking to find a way to express/capture the landscape to make it feel fresh. It’s a bit of struggle sometimes and other times it seems to come together intuitively. I’m glad you like the image, thank you for joining the discussion – it’s really interesting! If your technique which is your invention and not necessary over used or commonly used ubiquitous image, and a flying geese which is not even copyrighted by the Canadian Government is a kitsch, all the well known style of the photographer or painter not mention my use of fish-eye lens could stand no chance. I don’t think you need to be hesitant or shay over your style at all. When a crèche became a mass produced pattern which even a kids start to use as a funny decoration, it is a Kitsch. Yours has no resemblance nor anything near. Hi Karen. I feel that I make what I need to make. If others find it sentimental or “kitschy” I don’t care to worry about it. Clearly, artists don’t want to fall into a trap of echoing images or boomeranging ideas that have been trendy or have been overtly sentimental, but in the end if the artist’s whole being finds the outcome compelling, then it is at least, compelling to the artist. That said, you make gorgeous work. You have wonderful sensibilities. If the image feels compelling to you, for whatever reason, then chances are it will work for others too. For me, this image captures planes of dimension and movement so beautifully, that I don’t worry one little bit that the bird finds itself in the center of the composition. I believe sincerity speaks for itself, and there is no higher art than a purely sincere effort. Hi Elena, thanks for your perspective. Yes, making art that is true to who we are is the best we can do. There will almost always be someone who relates to it in some way. Perhaps it’s about the profusion of certain forms and what they mean to us. I don’t see anything kitschy about this image, I see something more ethereal as if viewing the scene within a dream. Bravo! This is still your beautiful, ethereal work, but maybe a little stiffer somehow. All I can suggest is if maybe the bird was not so central, maybe a little more lost in the trees to one side or another it would no longer feel kitsch to you … also I would love to see the pictures separately – especially the bird very small and alone in an empty sky. Hi Anna, thanks for your thoughts, I value them. I am going to post these separately. Yes, those moments of artistic struggle, trying to keep it fresh! Fantastic discussion and post title. I struggle with this too, why make more versions of those potential Canadian Kitsch landscapes. But like you said, you depend on the place to show you things. I think sometimes Canadian Kitsch could be what it reveals. Uneasiness, that important uncomfortable state of creativity. I really appreciate your honest questioning of your process. Hi Anne, It is an interesting discussion. Nice to hear from another Canadian! : ) Your perspective is appreciated, and yes, I think one can’t help but sometimes question what you make – maybe it helps push it further or reveals some motivation about how you work. I don’t mind being rattled every now and then. At any rate your landscapes or stunning and moving! To me it is a comfortable image. I have seen it for a lifetime, but there is something about the image that is a bit unsettling. That is the creative part formed by you making the image your own. The image causes the viewer to think about it. What does it mean to that person? What do they walk away with? I like your words, Carla. Comfortable, but a bit unsettling – it certainly got me thinking and I appreciate your thoughts, too. Thank you. I don’t find this kitsch (but maybe that’s a cultural thing – our flying ducks are pottery ones that go on the wall) – it’s a powerful image, beautifully balanced and very definitely one of yours. Thank you, Richard. I do wonder how much of it is my cultural exposure… I appreciate you thoughts. The same, only different. Yep, that either a rut or enlightenment. Could be either, huh? Always good to question yourself , I guess. What an awesome shot! It looks like you were in the right place at the right time, right? I for one love this – would like to see it printed small in a large mount; the fact that you have sort of broken the rule of thirds makes it more compelling. I think it was Douglas Bader who said ‘Rules are for the guidance of wise men and the obedience of fools’. It’s interesting to me that you mention how the image might be presented because I think size and presentation can really change how we perceive or experience an image. Maybe I will try printing that way and see if it changes my thoughts about it. The Kitsch-e-ness of this is the visual I have of a typical Canadian basement with wood panelling circa 80s. Somewhere on one of the walls there will be the iconic image you are searching for. The Made In China ‘Niagara Falls'(or pick your Canadian tourist destination) memento. Brown faux-wood background, Copper-like embossed metalwork. Subject – Canadian Geese flying over the wetlands, bullrushes and all. Copper-like chain secured at the top. Hanging for all to admire and bring up stories of the visit long past. Decided to look for one. Found something. Oh, a most excellent specimen! This is interesting, it seems it doesn’t please you because it is so very familiar a bit like the 3 flying china ducks on the living room walls in the Uk in the 50’s and 60’s I think it was.. They were not aesthetically pleasing at all but for some reason very popular.. now they WERE Kitsch . There is always something fascinating about birds in flight and glorious too.. but I can understand, if Canada is full of such images, why you might feel it is all too familiar but this one is very much Karen and so very individual.. .. Personally I like it very much.. Wonderful discussion point, Karen, I’ve been thinking about your post for a few days. Mostly I agree with those who’ve said, actually it seems like you have taken a very familiar image and re-approached it with your unique style, but I can appreciate that you still feel unsatisfied with it, uncomfortable with the overuse of the imagery. Newness is over-rated. Beauty, emotion, is what matters. Wonderful composition. My mother (who paints) and I have this conversation all the time. The vacillation between thinking we are always creating something new/original/fresh and the worry that we’re repeating (ourselves and others). My mother keeps painting the same trees on the same mountain. I keep touching on the same ideas and themes. At the time, we feel carried away in the moment, sure we have never said/seen it exactly like this before. We can’t help ourselves, we can only hope. How can we know? Kitsch is real art/feeling to somebody. There’s a fine line between kitsch, cliche, and universal truth. There’s an ethereal quality to this image, D&S, which stirs the creative mind. And if nothing is new under then sun, then uniqueness is a myth. Why compare anyway? It sounds like it was an excellent creative session. Art is to some is less about what is produced and more about the process. And may that process be always positive for you.